Mimaki textile pigment inks contain a binder and a binding agent, which fix the color to the fibers on heating, and print fabrics with vibrant colors without losing their breathability and water absorbability. A wide range of materials are available for print applications, including apparel, such as T-shirts, signage flags, and more. 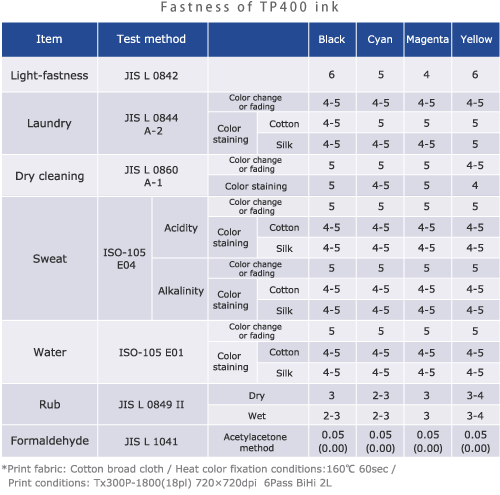 Furthermore, the ink has a low formaldehyde content and has minimal impact on human skin and the natural environment. 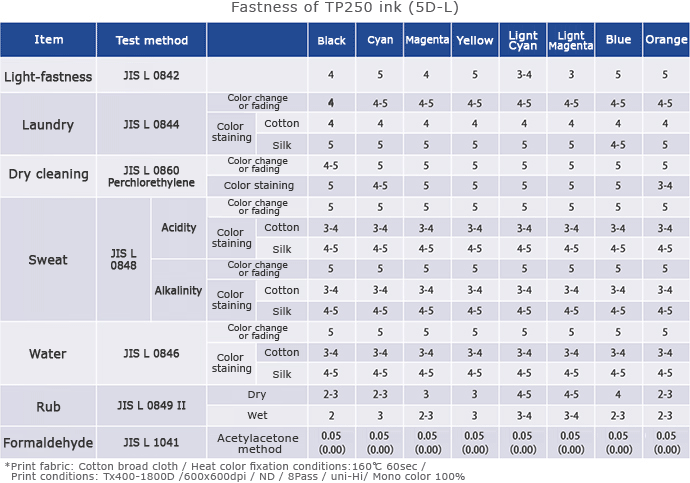 Mimaki has maximized the brightness, sharpness, and color reproducibility of these inks. A wider gamut of colors is achieved using spot colors. Outstanding and beautiful print quality is obtained for printed characters, logo marks, pictures, and paints. Gradations and lines are represented in detail. 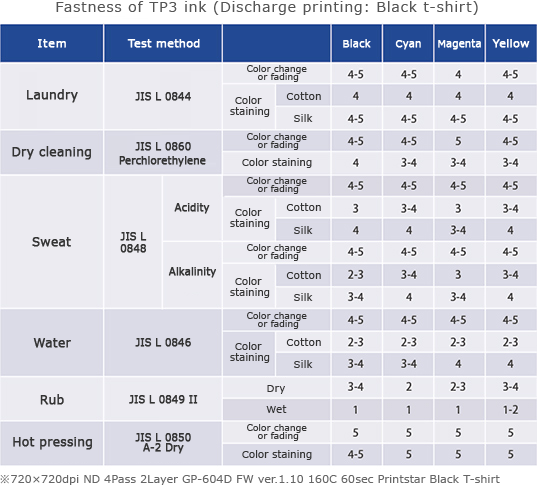 Mimaki developed a discharge ink (SPC-0540) for inkjet printers before its competitors. The discharge ink removes the color dyed with reactive dyes. Discharge printing enhances color contrast. 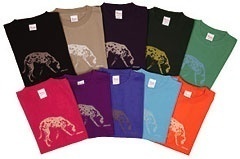 The natural fabric color is revealed or the reprinted color is represented more vividly on a dark base color. Thanks to Mimaki’s proprietary ink and printer technologies, discharge printing and color reprinting are simultaneously available. The printing process is completed by a single inkjet printer. This enables printing to start immediately after printer installation. Mimaki pigment ink is formulated for creating more beautiful printing and representing more detailed designs. No expert knowledge, techniques, facilities for dyeing, or pre- or post-treatments are required. Only a single inkjet printer is required to start printing of small lots. 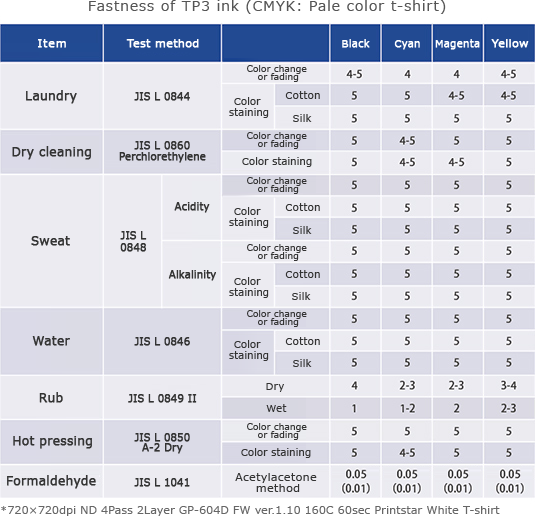 The ink has high resistance to light and fading and has achieved excellent test results* with respect to high washing/laundering fastness (Levels 4 and 5). Bright colors will not fade after long-term use and repeated washing or laundering. *Tests were performed according to test methods of the Japanese Industrial Standards (JIS).